The thing I love about this couple is the amount that these two love and support each other. I noticed it from the moment we met for coffee and hot chocolates and it just grew stronger. Working so closely with them in the lead up and more so on their wedding day, it was honestly so beautiful to see! Funny story and something I personally have never come across before, when we first had our initial meeting together to get to know each other to see if we were the right fit, I got to find out more about them and how they fell in love (my favourite part!) I also got to find out what is most important for them on their wedding day and help them focus on that. Beth told me that it was their second wedding and she wanted to do this one right, which was completely understandable. However, as we got talking some more I realised that they were actually married to EACH OTHER before! After a short marriage they parted ways back in the UK many years ago. Beth moved over to Australia and Andy found her on Facebook years later. They started talking again and then Andy moved over from England to be with her (insert gushing here) and the rest is history! I am such a romantic so I bloody loved that story! Morning of the wedding the guys partook in clay shooting in Chandler whilst the girls got pampered in the beautiful suite at Stamford Hotel overlooking the Brisbane River. We arrived to see the ladies and they were relaxed with a bottle of Veuve and personalised champagne glasses for each bridesmaid and of course the bride. Beautiful outlook and a relaxed morning called for an even better day ahead for this lovely couple. 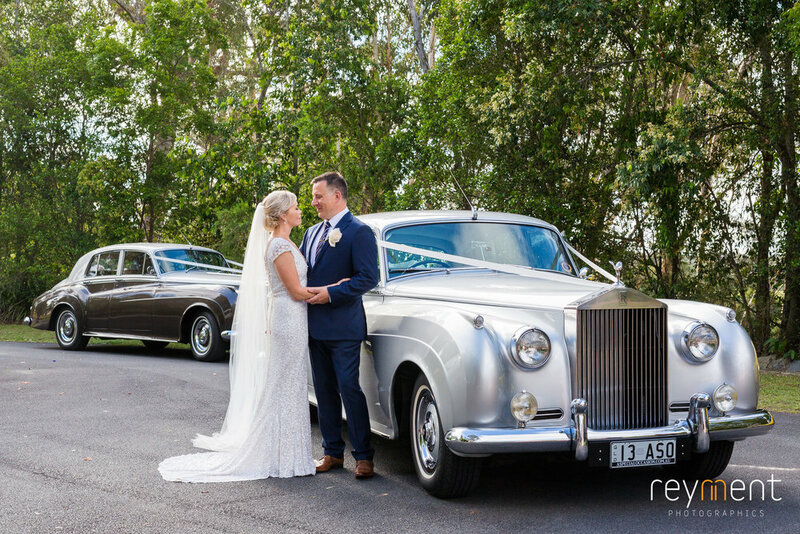 Beth & her girls loaded into their vintage Rolls Royce and meandered through the Brisbane streets making their way to the luscious Sirromet Winery in Mount Cotton. Beth eagerly awaiting to say I Do for the second time round to the man she loved and always loved. 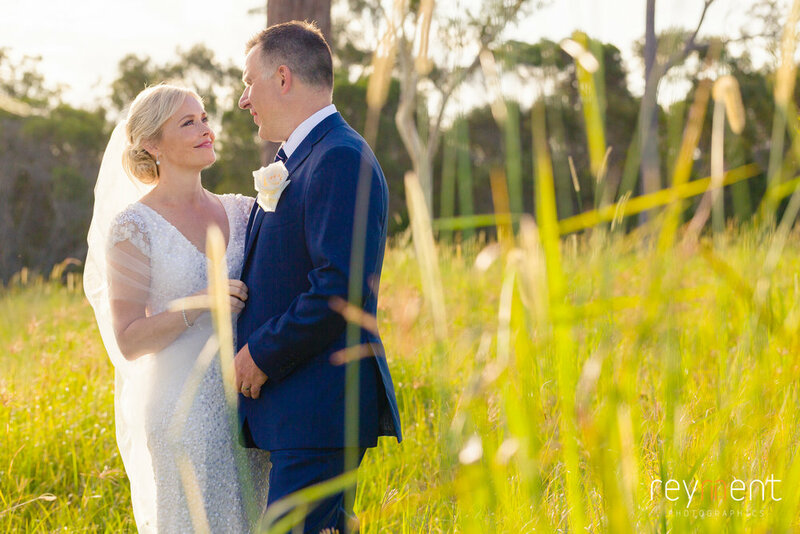 Beth & Andy chose the Laguna for their ceremony which is located right on the lakes edge and has the perfect amount of space for their 65 guests. It is private, secluded and above all absolutely breathtaking without the need for too much dressing of decorations. They really wanted their gorgeous cocker spaniels, Alfie & Mabel, to be part of their ceremony but with all the wildlife around they thought it would be best to not have them at the wedding, it would cause a lot of chasing! Instead they had a photo of them on the wedding programmes which was super cute! After the ceremony we gathered all the guests for group photos and then the bridal party went off to do their photos amongst the vineyards, wallabies and open land. John from Reymont Photographics managed to capture these perfectly! 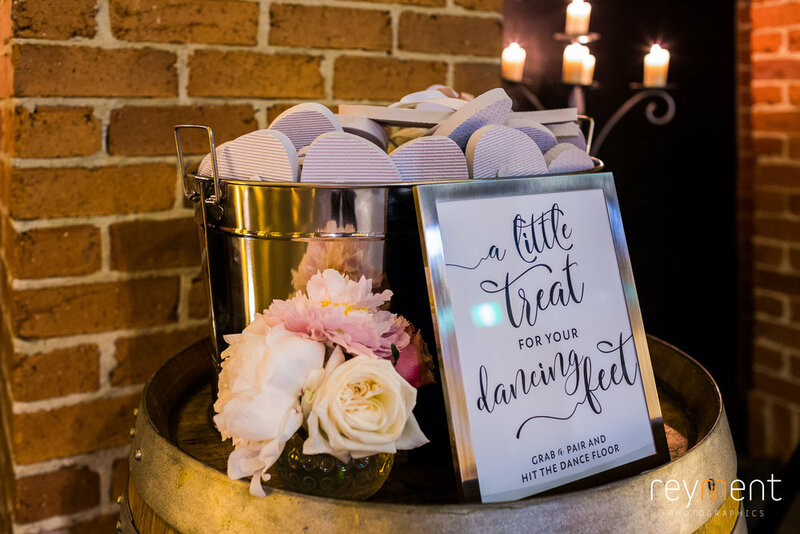 The guests moved over to another location on site to be greeted with champagne and grazing boards to tie the guests over until dinner. 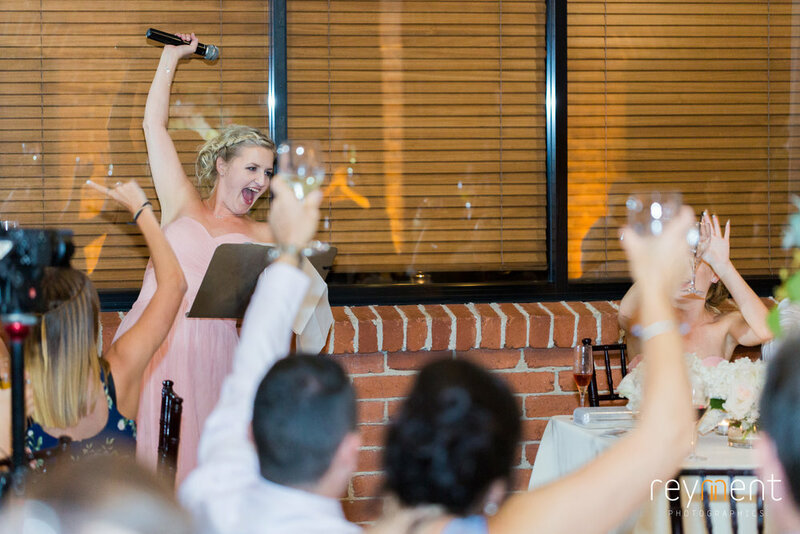 Music, lawn games and flowing beverages kept their guests more than happy! Sirromet also provided the bridal party with a cheese platter and drinks so they weren’t missing out on all the fun. 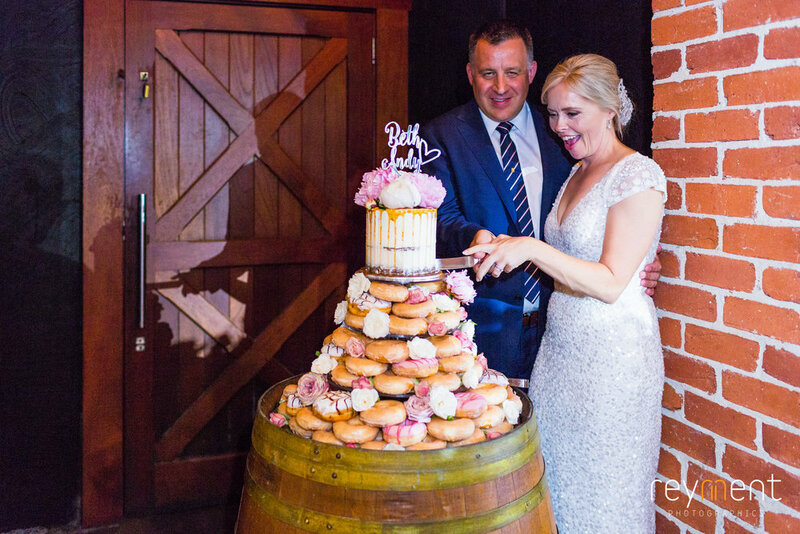 The reception was hosted in the Barrel Room which is a dark and moody room with brick walls and wine barrels to the ceiling. It is also an extremely romantic space! The room was set up with a main bridal table and round tables for the guests. Tall flowing floral centrepieces cascaded down the guest tables whilst the bridal table had plenty of low lying jars of flowers. The room looked and smelt amazing, top that with the flickering tealights. It was elegant and romantic, exactly what Beth had in mind. Also another tip whilst I am the subject. Pinterest is an amazing tool but you can pin a million different ideas from said table numbers to place cards. Start off with one board where you pin anything you like the look of. Then later once you have a clearer idea of your theme then go through and either delete certain pins or create a new board with only 2 sets of place cards (rather than the 100 that you probably currently have.) Just makes it a little bit easier to see the vision of your day come together. 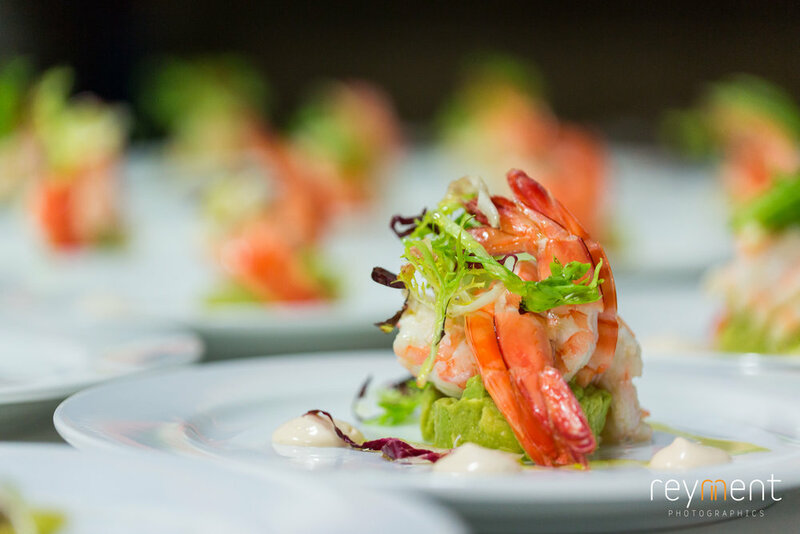 Sirromet wowed their guests with a 3 course alternate drop menu and the food was beautiful! From the pork belly to prawns and avocado stack for entree, the beef fillet and chicken breast for mains followed by chocolate brownie and creme brûlées for dessert. 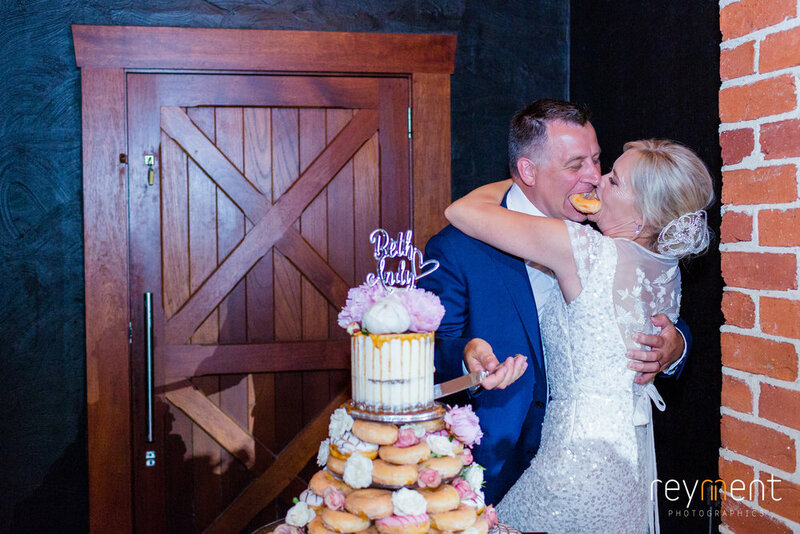 Oh and don't forget the wedding cake doughnut tower, guests certainly weren't leaving hungry, in fact, a lot of them had their second doughnut to go! 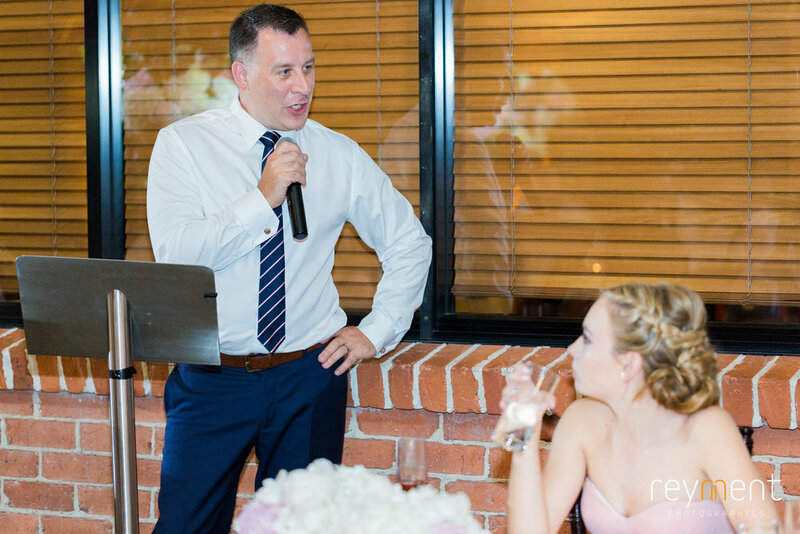 Beth & Andy hired G&M Entertainment to oversee all of their musical needs throughout the day, they also chose to have them as their MC for the evening. Glenn was amazing! He took the time to really get to know Beth & Andy, this guy certainly did his homework on what made these two tick! Glenn did all the traditional stuff but threw in a few games along the way to keep the atmosphere pumping. A popular and favourite game is the "Shoe Game". For those who don't know this game, it is where both the bride and groom remove their shoes and hand one shoe to the other. The MC then reads out a number of questions about the couple and they then respond the answer by holding up a shoe that relates to the owner. "Who wears the pants in the relationship" is always a crowd pleaser! Thank you to suppliers involved! 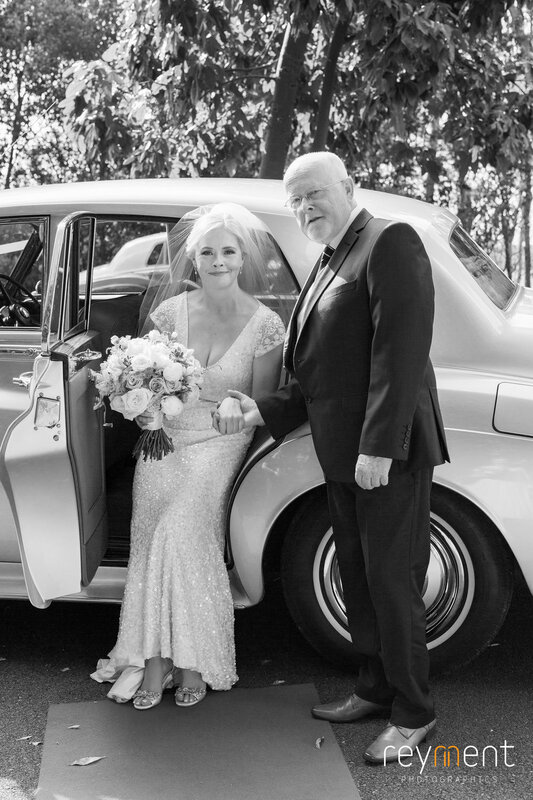 Everyone had such a magical day celebrating such a special day for these two wonderful people! 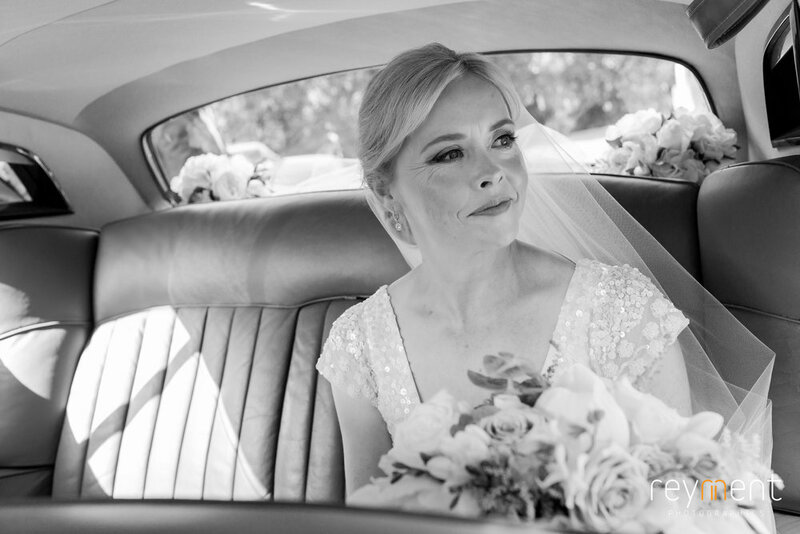 Thank you so much Beth & Andy for letting me play a part in your special day. Beth, thank you for entrusting us with your vision, I hope it was everything you had wished for and more! You have an amazing group of family and friends who celebrated your special day in style! Congratulations again to a beautiful couple!